Every so often you see something at parkrun that surprises you and even inspires you. Perhaps inspiration is often there if we only have the inclination and eyes to see it. Such was the case today. A beautiful September morning brought a cooler 'nip' in the air. But that didn't deter 874 runners from assembling in the common for the 324th Southampton parkrun. After an unusual year of weather so far with two helpings of snow in March, electrical thunder storms in April and a blazing hot spell over summer, will there be any more surprises for Autumn parkrunners? Perhaps not a meteorological surprise today, but a surprise none the less. Having led a small voluntary training session after last week's parkrun to help us understand the challenges faced by visually impaired runners, run directors Malcolm and Jill White unveiled the fruits of their labours today. Around half a dozen running pairs tethered themselves together with one person wearing a blindfold to simulate visual impairment, and the other guiding and talking them through the run. Even some youngsters got in on the act, which was very brave and looked like good fun. Halfway round, some pairings changed roles. So the surprise today was ... more inspiration from parkrun ... as if that's possible! It is clear that parkrun already has numerous benefits on top of physical well-being. Here was another one. This educational demonstration of practicality, trust, fun and inclusiveness was a humbling sight to behold. I can't speak for all 874 runners, but I think most of us felt lifted when we came upon these volunteers, like fairy dust for our tired legs. 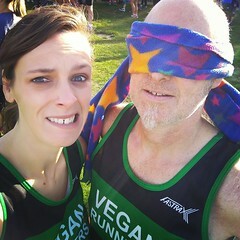 I spoke to several of the couplings, as we jogged round and discovered that the blindfolded runner found, perhaps not unusually, everything much louder. I also heard one leader relishing the chance to swap places as she found the guiding experience quite intense and said, "I'm exhausted!"" So a huge thank you to Malcolm and Jill and all their volunteers. Perhaps this has opened our own eyes are a little more and has helped us be a little more grateful. Another inspiration today was talking to our own Dave KEATES of Itchen Spitfires running club. Dave does a lot of run pacing, some call him the "metronome", but I prefer "Time Lord". He was a pacer at the Southampton Half Marathon back in April (between thunder storms). I stuck with Dave and he delivered a cherished goal for me of a time under 2 hours. Although setting a new PB for himself at last week's parkrun, he spent today's event forgetting all about that by helping and coaxing a few friends to achieve their own good times for the month of September. Exemplary stuff! There were milestone runs today for Luke STRAIN, Emma MACKENZIE, Dawid BILSKI, Tina DYER-SLADE and Lou SANDERS all collecting their 50th, and Lucy ASHTON and Mylene PLOYAERT gaining their 100th. Mylene actually ran her 100th last week, but forgot to mention it. So today's Run Director, Peat ALLEN, put that right in his announcements before we set off. Last but not least worthy of mention was my daughter Lizzie HOWARD, who recently joined Hedge End running club, and at this her second parkrun took 10 minutes off her previous time. Mind you there was two years between her first parkrun and this! Congratulations to all these determined runners. Of course all these events, PBs, insights and inspirations were only made possible by the always visible but often unnoticed volunteers; 55 of them this week. As ever we are in their debt and very grateful. Who knows what we will see, and what will be in store for us at parkrun in the coming weeks; whatever it is let us remember today and keep our eyes and ears open. This week 874 people ran, jogged and walked the course, of whom 56 were first timers and 138 recorded new Personal Bests. Representatives of 41 different clubs took part. The male record is held by Mahamed MAHAMED who recorded a time of 14:56 on 17th September 2016 (event number 221), and by Unknown ATHLETE who also recorded a time of 14:56 on 8th September 2018 (event number 323). Southampton parkrun started on 7th July 2012. Since then 19,561 participants have completed 186,991 parkruns covering a total distance of 934,955 km, including 32,678 new Personal Bests.